Topline group opened its doors to global expansion by launching their first international office in New Delhi, India today. The company – Topmind Communication Pvt Ltd is a subsidiary of the Topline Group. Key people present for the formal inauguration were Michael Song, Chairman & Founder, Topline Group; Yan Han, Chairperson International Business; Sagar Joshi, Country Manager, Topmind Communications, and Ritu Kaul, Chief Strategy Officer & Director- Research & Insights. The office inauguration was a formal yet simple affair with a ribbon cutting followed by a celebratory cake. 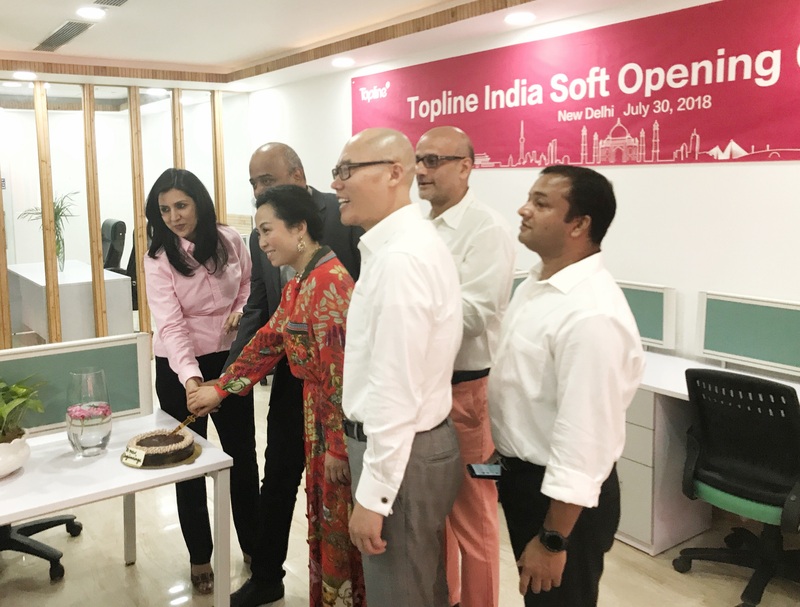 Speaking at the launch, Chairman & Founder Michael Song said he was elated at the launch of this new venture and looked forward to seeing how Topline China and Topmind India can come together to offer distinctive services to drive business growth for clients. The cutting edge digital expertise of Topline China combined with the experience and expertise of the Indian team will drive business synergies towards a differentiated product and service offering for the Indian market. Topline will, for the moment, continue to provide a critical environment for enhancing as well as expanding operations in their India office. Topline Group is one of the fastest growing public relations and marketing communication firms in China with more than 300 professional staff across offices in Beijing, Shanghai, Shenzhen, Hangzhou and Chongqing cities, servicing such leading brand names as Huawei, Tencent, Sogou Technologies, VIP.com, Ping An Group, CITIC Bank, DBS Bank of Singapore, Mondelez and SABIC of Saudi Arabia, Huntsman of US and Voith of Germany in a range of industries spanning smart devices, Internet, financial, banking and other B2B sectors. The US launched five separate WTO dispute actions on Monday challenging the countermeasures taken by China, EU, Canada, Mexico, and Turkey following US tariffs on steel and aluminum. The US claimed that its new tariffs are meant to protect national security and fight unfair trade practices. From the perspective of the US, the retaliatory measures by the five countries are in violation of WTO rules. But what about the Section 232 steel and aluminum tariffs by the US? This section in fact puts domestic law above international trade rules and is responsible for the trade war. Trump has repeatedly suggested pulling the US out of the WTO, according to US media. The WTO, previously known as the General Agreement on Tariffs and Trade (GATT), was originally an important part of the global economic system set up by the US after World War II. It was an international agreement led by major developed countries, including the US and countries in Europe, with the aim of fighting trade protectionism and regulating and promoting international trade. Then why is the US so eager to get rid of the well-regulated system and the international trade agreement that was once dominated by it alone? Is the WTO changing or is the US changing? The WTO has not changed albeit improvements designed to enhance its functions. What has really changed is the US, which is steadily moving in the opposite direction of the system it has built. In the era of globalization, emerging economies are rising rapidly, and the global trading system, logistics, supply chains, and production chains have undergone profound changes. Emerging economies have benefited a lot, and the US and other developed countries have reaped huge benefits as well. However, relatively speaking, the US control over the global trade chains, production chains, and value chains is not as powerful as in the past. According to Joseph Nye, an American political scientist, the US intense agitation reveals the decline of American hegemony. The best way of responding to trade bullying is to uphold the multilateral rule-based trading system of the WTO and defend its dignity. This is the basic responsibility of each member. International economic and trade disputes must be resolved by WTO rules. Since China’s entry into the WTO in 2001, China has strictly fulfilled its commitments and has made tremendous contributions to global trade and economic development through its own development. The US accusation against China is groundless and will not shake China’s determination to promote reform and opening-up and to firmly uphold the principles of the WTO. China will never make any concessions on the major issues concerning the rules of international trade. With the escalation of the trade war, more industries will be affected. It will be difficult to decide who will receive subsidies and who will not. Trump’s administration is disrupting the basic logic of economic life. By causing trouble for China, the EU, Mexico and Canada, it is plunging the US domestic economy in chaos. People may wonder why the US government started the product exclusion process for Chinese products subject to Section 301 tariffs through the office of the US Trade Representative (USTR) only a few hours after announcing tariffs on $34 billion worth of Chinese products. The public can file exclusion requests until October 9 this year. Any exclusions granted have to meet three requirements and will be effective for one year. The intention of the US can easily be seen. The US is desperate to rescue its domestic companies while trying to hurt China. In the $34 billion list, roughly 59 percent of the goods are made in China by multinational companies, 70 percent of which are US firms. And the products manufactured by China are irreplaceable in the global production chain. So the US has to come up with a way to avoid damage to its companies. Can product exclusions save US companies? On the long list of items subject to the US tariffs, a large portion is travel products including luggage, wallets and backpacks. The market for travel products is worth $31 billion, and 87 percent of the products are made in China. Matthew Shay, CEO of the National Retail Federation (NRF), recently said the tariffs are hurting American consumers instead of resolving trade issues with China. “Retailers cannot easily or quickly change their global supply chains,” said Jonathan Gold, NRF vice president for supply chain and customs policy. Nearly 70 percent of US firms in China oppose the use by the US of tariffs as bargaining chips, according to a report by the American Chamber of Commerce in Shanghai. They probably do not want to join the line of those applying for exclusions. Many US high-tech companies have high expectations for China’s manufacturing potential and are hoping for long-term cooperation. Even if they get product exclusions, they will only be valid for one year. The US government has pushed its elite companies into a hard position, and many may eventually move their production facilities to China or even build their headquarters here, like Tesla. If US President Donald Trump escalates the trade friction by extending the tariffs to $200 billion worth of Chinese products, the damage to US firms will increase. And the opposition to his policies will also become stronger. The companies do not want to lose the Chinese market, which has enormous consumption potential. And despite some ups and down, US firms in China have mostly had a smooth path. But they could not withstand the collapse of Sino-US trade relations. It is worth noting that US firms have seen relatively low investment return rates in China, and this has been distorted into an example of unfair treatment by China. But this situation is common and has been seen by foreign firms operating in many markets, including Japan, Australia and European countries. Most US firms in China are optimistic about China’s stability and the sustainability of its market. They hope China can keep up the pace of its opening-up, better protect intellectual property rights, and lower the bar for entering the market. Therefore, few US companies have left China. Data released by China’s Ministry of Commerce shows that in the first half of this year, there was an increase of 96.6 percent year-on-year in the new companies registered by foreign investors in China. And the number of foreign investors is expected to keep growing in the next five years. China aims to create the best environment for businesses around the world. The product exclusion process announced by the US shows that the Trump administration needs to clean up its own mess as the tariffs have so many drawbacks and are only drawing opposition. China will keep to its opening-up promises and will be a firm defender of free trade and multilateralism. The author is executive deputy director of the China Center for International Economic Exchanges. High-tech sectors have been put on a main battlefield of the trade war unilaterally provoked by the US, which has already angered the whole world. From the fine on Chinese tech firm ZTE, to the high tariffs levied on Chinese high-tech products, the US administration is aiming at nothing but containing the development of China’s high-tech industry. How can China’s high-tech enterprises, especially those in the internet information sector gain a foothold when facing the overwhelming technological monopoly of the US? The answer, I believe, is to step up efforts on research and development of the country’s own technologies, and build a safe and controllable system of information technology. Some believe that Chinese high-tech industry should establish its own advantages, but the fact is that China has always been in a passive and defensive position in this monopolized market. Though the country has made tremendous achievements in internet information technologies, it still sees a large gap between itself and the US. China is still dependent on other countries in many core technologies, and many foreign products and services still monopolize its market. A risk control is more important against such background. It is almost impossible to break monopoly in the information technology industry, which is different with some traditional industries like auto sector. The automobile market is also dominated by some big names, but the emerging manufacturers still have space to expand ground through differentiation and co-exist with the former comers. The competition is fierce, but the market is far from being monopolized. However, that is not the case in the information technology sector. Only a few brands can exist under each sub-sector, and even excellent new technology probably cannot survive the competition. For instance, the Windows operating system of the Microsoft has monopolized users’ desktops, but it still tumbled in the mobile operating system competition. The failure of Microsoft in this area is not because of technologies, but the lack of ecology. Similarly, Intel has control over both desktop and server markets with its advanced CPU technologies, but its performance in the mobile sector is far from passable. Both examples indicate that the existing monopoly in information technology industry may kill new techniques, even the great ones. In other words, the information technology industry is challenged more by monopoly. As a result, apart from making breakthroughs in research, China also has to find a way to break the monopolies of transnational corporations in order to gain a foothold on the market. Absolute fairness doesn’t exist in internet information industry, not to mention orders and rationality. We therefore cannot count on reasoning with the US in hope of ending its monopoly. It’s not easy for new technologies to coexist with monopolists in the internet information industry. In light of such backdrop, China would take considerable time developing its own controllable alternative solutions in the future. The process might have two finishes: failure or success. As long as the alternative solutions work out as planned, they will finally gain a foothold. In general, whether new technologies can replace old ones depends on both their own competitiveness and ecology, and the latter is sometimes more decisive. It can be well explained by the above two examples of Microsoft and Intel. As a matter of fact, the number of users and number of technologies are in a proportional relation. Such virtuous circle calls for enough support from the market, otherwise the technology won’t survive a chance. Given such background, research and market should be given equal weight when developing internet information technology, as Chinese President Xi Jinping has also stressed the importance of intensified research on core technology under the guidance of market. Currently, a majority of the internet information markets have been monopolized by foreign enterprises, so the exploitation of government procurement market is of vital importance for China. China has not yet joined the WTO’s Agreement on Government Procurement (GPA), so its government procurement market remains closed. This sector, as a result, enjoys a great chance in developing China’s own core technologies. Though it only accounts for a very small percentage of the country’s general market, it still has a size equivalent to that of a major European country thanks to China’s huge economic aggregate. China started to develop controllable alternative solutions on electronic official documents in 2014 under the instructions made by Xi in December 20, 2013. The fruits scored in this field have encouraged the development of other sectors. For instance, the secure intranet project built by China Aerospace Science and Industry Corporation Limited (CASIC) has become the country’s largest controllable production system with the best performance. The system, which now serves 100,000 users, is a result of 4 years’ research and development and an investment of 300 million yuan. The domestically-developed controllable alternative solutions are expected to be extended in the information technology sector, and the core technology will break the monopoly of foreign brands and gain a foothold in the market. It will also ensure the Internet security of government and other important sectors, replenish the short boards of China’s internet information technologies and ultimately help the country get rid of its dependence on others. Foreign citizens of Chinese origin and overseas Chinese are closely following the trade war that the US waged against China, saying that countries around the world do not want to see a trade war between the two countries. In the US city of San Francisco, Cai Wenyao, an adviser for the US Chinese Chamber of Commerce, found that buying corn is cheaper than before. “The price of one corn has dropped from $0.5 to $0.25. This price fluctuation may be related to the limited exports of US corn and to the dumping of corn in the domestic market,” Cai said. “The counter-measures adopted by China greatly impact the middle and lower classes of the US. On one hand, manufacturers pass on increased costs caused by higher tariffs to consumers, indirectly increasing the living cost for ordinary people. On the other hand, the counter-measures for agricultural products directly affect the sales and these products have seen a sharp drop in prices, which decreases farmers’ income,” Cai noted. China-US trade friction not only directly affects the interests of related industries in the US, but also exerts great psychological pressure on employees in other related industries, American scholar Zhang Jun said. The economic complementarity between China and the US has weakened to some degree, and competition has intensified with the rapid growth of China’s economy in recent years. One of the reasons for the trade friction is that the US regards China as a potential opponent in terms of economic and trade relations, according to Zhang. China-US relations will become more and more unstable as the friction heats up, which will have a negative impact on the global economy and international community, said Nan Gengxu, chairman of Global Max Media Group. At present, China-US trade friction has reached an impasse. China is ready for the long-term trade friction, and is also actively seeking a way out by turning to global markets. China-US trade friction has objectively encouraged a closer economic relationship between China and Europe, according to Shi Zhongsheng, President of the Fujian Federation of Industry and Commerce in France. Shi believes that the European economy has also been severely affected by US trade protectionism. Therefore, European companies can make up for some of the gap in China’s demand for imported US goods, providing new opportunities for China and Europe to expand cooperation. On July 9, China and Germany signed more than 20 agreements totaling $30 billion in Berlin, covering a wide range of fields, including vocational education, climate research, autonomous driving, and health care. For developing countries, China-US trade friction has not affected the trend to build closer trade relations with each other. “China has a huge consumer market. Many companies in Thailand and Southeast Asia have seen opportunities from China’s reduced imports from the US,” said Zhang Jie, a member of the Chinese Language and Cultural Education Foundation in the Philippines. Zhang noted that the China-proposed Belt and Road Initiative, which features win-win cooperation, is gaining wide-ranging consensus among the international community. He also pointed out that economic globalization is an irreversible trend and said it is unwise for any country to impose trade barriers. For mutual benefit, the two sides will need to work out their trade issues through negotiations on the basis of trade liberalization. The European Commission recently released a supplementary statement of objections on an in-depth investigation into alleged monopolistic practices of US chip supplier Qualcomm, after the commission fined Google high for breaching the antitrust rules of the European Union (EU). The penalties, coming amid strained trade ties between the EU and the US, is regarded as a signal that good days of American technology giants in the EU will come to an end as Washington keeps increasing tariffs on EU products. The statement is a procedural step of the investigation against Qualcomm based on the EU anti-monopoly rules, the commission said. The investigation against Qualcomm was initiated by the commission in December 2015 after the US chip maker was accused of monopoly practices by one of its major rivals. The focus of the 2015 statement of objection was assessing whether or not Qualcomm had sold chipsets at prices below cost in order to edge out its competitors, while the supplementary statement issued this time will mainly conduct investigation on how much below cost the US company was selling its baseband chips. The EU has already fined Qualcomm following the previous antitrust investigation. In January this year, the European Commission disclosed that between 2011 and 2016, Qualcomm had been making significant payments to Apple on condition it would not buy from rivals. An agreement signed by the two made clear that Qualcomm would reduce the payments to Apple if the latter breached the rule. The EU decided to fine Qualcomm $1.23 billion, which equaled 4.9 percent of the company’s turnover in 2017, as the agreement was found to have severely violated EU antitrust rules and adversely affected fair market competition. This time, Qualcomm might face penalties of up to $2.3 billion if the latest EU accusation against it turns out to be true. The figure is 1/10 of the company’s global revenue – with the ratio being the upper limit of fines for monopoly practices under EU rules. The EU judicial department disclosed recently that it had sent a new list of accusations to Qualcomm. Analysts pointed out that these papers usually reaffirm the preliminary conclusion drawn by the supervisory organization and explain the initial allegations to the company concerned. The EU statement, though said to be just a routine procedure, is widely regarded as a counter measure against the high tariffs imposed on European products by the US amid the escalating trade disputes between the two parties. It is noteworthy that just one day before announcing the additional investigation into Qualcomm, the EU fined Google a record-breaking 4.3 billion euros (around $5 billion) for monopoly. The European Commission said it was fining the US tech giant for abusing the dominance of Android and pre-installing Google Search on Android devices to ensure that traffic on Android devices goes to the Google search engine and therefore cement its dominant position in general internet search and shut out its rivals from the market. It was the second penalty Google had received from the EU this year, which was thought-provoking against the backdrop of the escalating trade tensions. The trade friction between the US and many economies including China and the EU has not eased. In fact, it has worsened. Yet the US is using several tricks in public opinion warfare in an attempt to create the false impression that the US is the “victim” in the trade war. First of all, the US knows “who is speaking” is more important than “what has been said.” Thus, following US President Donald Trump, US Treasury Secretary Steven Mnuchin, US Trade Representative Robert Lighthizer, and National Economic Council Director Larry Kudlow released statements respectively to justify US trade protectionism. They selectively chose “facts” and “data” to serve the purpose of depicting the US as the “victim” in trade. The US, through various communication channels, created the illusion of “social consensus.” The Department of Treasury, Department of Commerce, Department of Justice, and the US Trade Representative all used so-called “facts” to justify US actions. Moreover, many senior officials in the Trump administration are familiar with the characteristics and needs of various media, and know how to deal with the media to achieve a desirable communication effect. Therefore, sometimes US officials deliberately show toughness in front of the media. Fourth, the US cites various reports and data to mislead the public into thinking that the US is justified in the trade war. But in fact, if one takes the time to delve into some of the reports’ details, one can find plenty of data flaws and logical loopholes. The trade war with China is a systematic confrontation between the two countries in terms of strategy, coordination of various resources, and global mobilization capabilities. As an ancient Chinese saying goes, “The supreme art of war is to subdue the enemy without fighting.” This is true of public opinion warfare. Knowing better the tricks the US uses in the trade war will help China take more effective countermeasures. “The US is now the biggest wrecking ball to world stability and certainty,” China’s Foreign Ministry spokesperson warned against the US’ efforts to convince its allies to take on China more aggressively over trade issues on Friday, as experts also cautioned that the US’ plan will be met with frustration. The US will seek to convince Japan and the EU to join it in a more aggressive stance against Chinese trade practices when financial leaders of the world’s 20 biggest economies meet in Buenos Aires this weekend in Buenos Aires, Reuters reported, but predicted that its hostile tariffs are set to leave US Secretary of the Treasury Steven Mnuchin in cold. “As the No.1 power in today’s world, the US should at least think about its responsibility before making relevant policies or saying or doing anything, because it is the ‘order’ of the world that they are expected to promote, not ‘chaos’.” Foreign Ministry Spokesperson Hua Chunying told a regular press briefing. “I said the other day that knowing someone is intelligence but knowing oneself is real wisdom. Today I want to add that nothing could be more disastrous than chaos,” she added. The weekend event is also the first G20 financial meeting since China and the US exchanged tariffs on $34 billion of each other’s goods. Mnuchin will hold separate bilateral meetings with officials from France, Canada, Germany and Mexico, among others, the South China Morning Post reported, adding that G7 officials on hand for the broader meeting would also hold an one-hour session during which they would again discuss “concrete action with regard to China and its economic aggression”. The Reuters report is not optimistic about the US plan, holding that such efforts will be complicated by frustration over US steel and aluminum import tariffs on the EU and Canada who have responded with retaliatory tariffs. “I have noted that many US citizens and its allies have spoken out unreservedly. The US is now the biggest wrecking ball to world stability and certainty. Its unilateralism and protectionism pose the greatest threat to the international rules and the world economic order,” Hua stressed at a briefing, responding to a ridiculous claim by a senior US official. “The retail price for Apple’s iPhone 7 starts at $649, but manufacturers in China only get less than 1% of the value. When China exports a $450 worth of business suit to the US, China gets 5% of the profit while the US gets 84%,” Hua refuted his words with facts. “I am curious how the US side would like to explain these figures. Do they also want to cite these figures to prove that the US is shortchanged in its trade deals with China and China is playing the zero-sum game here with the US?” she asked. “Everyone is watching when the US side behaves like this in international relations, and everyone is hearing and seeing what the US officials are saying and doing. So, we all know what the whole world thinks of the US,” the spokesperson pointed out. The EU is ready for retaliation if US President Donald Trump puts tariffs on imported automobiles and auto parts, its trade commissioner Cecilia Malmstrom warned on Thursday at a press conference, stressing that the EU has no other choices but to react though it does not want an escalation of the conflicts. The EU is preparing a new list of American goods to hit with protective measures if a mission to Washington next week fails to persuade Trump not to raise levies on car imports, Bloomberg reported, citing two officials with knowledge of the issue. A New York Times comment said that the EU is getting closer to China and Japan to buttress a global system as Europe and other parts of the world have accepted that Trump and his mission of disruption are not going away, after months of denial, anger, bargaining and depression. Financial Times, in a commentary, called on the whole world to “join battle in Trump’s trade war Premium” as the best reaction against “America First” is to leave America behind. Despite of the pouring blames, the Trump administration goes his own way under an “America First” policy. The US Congress is mulling the first major change in a decade to the rules governing foreign investment reviews, a Wall Street Journal report disclosed on Friday. “Negotiators from the Senate and the House reached a deal on the final text of the provision to bolster both the Committee on Foreign Investment in the US and the US export-control system, in an effort to block Chinese and other foreign transactions that could harm national security,” disclosed Senate Majority Whip John Cornyn. The bill was previously strongly resisted by some lawmakers and big companies out of their worries that the overseas investment will face excessive restrictions. The US administration’s “America First” policy did not win it expected supports. US officials and public are up in arms about Trump’s plans to impose import tariffs on cars and auto components, said a Deutsche Welle report on Friday. In a hearing held on Thursday, many representatives protested against the tariffs, in a belief that it will result in rising prices of cars, more expensive imported parts as well as tariff retaliation from its allies, according to the report. Arkansas governor Asa Hutchinson said he will send economic official to China out of concerns that the US tariff may hurt the economy of his state, while pointing out that retaliatory measures from Canada and Mexico worry him more. The latest survey made by Pew Research Center revealed that more Americans see negative than positive impact for the US tariff against China, the EU and other trading partners. Nearly half (49%) of surveyed take it as a bad thing for the US, about 40% polled regard it as a good thing, while the rest 11% don’t know how the tariffs will affect the country, the research showed.